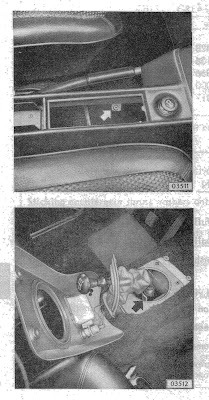 Daniel Christy from Singapore mailed me about a problem with foul gasses filling his Opel Manta A series, the source for the effluvium had nothing to do with a spicy oriental diet, but rather the "big gap around the gear stick" which he has had to stuff some rags in. The gearbox should be equipped with two rubber draught seals; the smaller one is visible at the base of the gear lever and attaches to a steel plate screwed to the transmission tunnel and covered by the centre console. The second is much larger and sits on the top of the gearbox where the gear lever connects to. Both of these seals are needed to keep noise, draughts, dirt and fumes out of the cabin. Fitting the gear lever bellows type gaiter isn't a complicated job, it is a bit fiddly but gets easier the second time! First remove the centre console, it is located by self tapping screws, some will be covered by a blanking plug or hidden under the ash tray. Next slip the bellows off the transmission tunnel mounting plate. Now you have access to the bottom of the gear lever and can disconnect the gear lever from the gearbox. To do this, unclip the strong spring that biases the gear lever towards the 3rd and 4th gear detents. Next, remove the circlip that locks the connecting pin in place and push out the connecting pin. The gear lever can now be pulled upwards to disconnect. Cut away old or damaged bellows with a knife or snips. If you have the time, this is an ideal opportunity to clean and repaint the gear lever shaft. Slide on the new bellows, if they are tight don't force them, use WD40, silicon, washing up liquid or similar lubricant. Reassemble the gear lever and centre console in the reverse order to disassembly.